Q: When can I call to place an order or ask a question? A: Our office is open from 8 a.m. to 4 p.m. Monday through Friday. Outside of these hours, we are not available by phone, but you can contact us via email and we will get your request the next business day. Q: Do you have a storefront or retail location? A: No. We are a production and distribution facility only. If you are interested in buying our products in person, we can help find a retail location or distributor near you who carries our products. 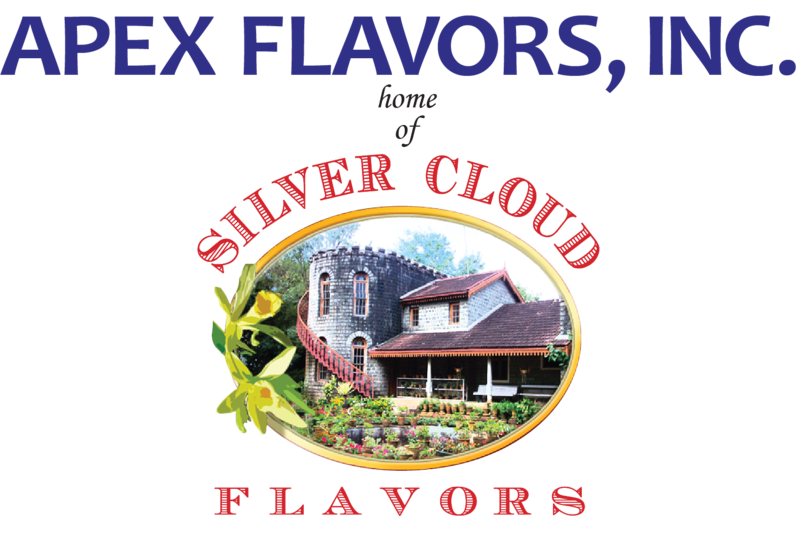 Q: Can I use Apex Flavors, Inc. products to flavor e-cigarettes? A: No. Our products are designed and intended for use in food and drink for human consumption, not for inhalation, use in e-cigarettes, vaping devices, or electronic nicotine delivery systems. They have not been tested or deemed safe for use in e-cigarettes, vapes, or any use outside of food and drink. We do not sell or distribute our flavors to anyone who intends to use them for these purposes. Anyone who uses Apex Flavors, Inc. products outside of their intended use in food and drink does so at their own risk and without warranty, either expressed or implied, from Apex Flavors, Inc. or its suppliers. The user assumes all liability for loss, injury, damage, or expense resulting from such uses. Q: There are several different versions of this flavor. Which one should I use? A: Our products are categorized by use. The same flavor may have several different formulations, depending on the application: baking, alcoholic and non-alcoholic beverages, ice cream, etc. If you need help figuring out which application a product is formulated for, look at the product number. Q: What does “TTB approved” mean? A: The Alcohol and Tobacco Tax and Trade Bureau (TTB) regulates ingredients for use in alcoholic beverages and their labeling on ingredients declarations. Any of our products listed under Beverage Industry -> Craft Brewing/Wine/Spirits, or with an item number ending in the letters TTB, has been approved for use in alcoholic beverages. Check the product description for more information about whether a specific flavor requires an artificial ingredient label declaration. Q: What does “WONF” stand for? A: WONF stands for With Other Natural Flavors, and means that the extract contains natural flavors from other sources than the main flavor ingredient. For example, a tangerine flavor may contain additional natural orange flavor to enhance the citrus notes in the finished extract. Q: How can I get kosher certificates, specification sheets, Flavor Ingredient Data Sheets, or Material Safety Data Sheets for your products? A: You can get a printable spec sheet, MSDS and nutritional fact sheet by following the links at the bottom of the product page. If you need a kosher certificate or FID Sheet, send an email to [email protected] or [email protected] indicating the documentation you need, as well as the product name(s) and item number(s). You can also call us at (410) 565-6600. Please note that it may take several days to receive the requested documentation. A: We do not have a required minimum order size. You can order as much or as little of our products as you need. Q: Are there discounts for ordering in large quantities? A: Yes. We offer wholesale pricing on quarts and gallons only for manufacturers and distributors. If you are interested in receiving wholesale prices, please fill out the wholesale form. Wholesale orders must be placed over the phone; the website will charge you full retail price. Q: Do you have a catalog of wholesale prices? A: No. Since the prices of individual products vary so frequently, we do not distribute a catalog or list of wholesale prices. If you want to know a particular product’s wholesale price, we will be happy to give you a quote via phone or email. Q: Do you keep my credit card information on file? A: No. For security reasons, we do not keep any credit card information on file; please have your credit card information (including expiration date, security code, and billing zip code) handy when placing an order. A: Our products ship by FedEx or United States Postal Service. Q: Can my order be shipped to a P.O. box? A: Yes, orders can be shipped to P.O. boxes via USPS. A: Orders typically take 3-5 business days to be delivered in the contiguous United States. Since we are located in Maryland, orders will ship to locations on the East Coast faster than to West Coast locations. Shipping outside the contiguous United States will typically take a few extra days for Alaska, Hawaii, Canada, and Mexico. Europe and other international destinations may take up to two weeks. Q: Can my products be shipped overnight or with expedited shipping? A: No. Because they are flammable, most of our products are subject to hazardous materials shipping restrictions and cannot be shipped by air. Q: Why did I get two different tracking numbers for the same order? A: Your order contained items that were back-ordered or not currently in stock. The first tracking number is for the items that we had in stock; the second tracking number is for a shipment containing your back-ordered items. Q: One or more of my items is back-ordered. When will I receive my products? A: Back-ordered items are the first to be filled when we get a new shipment, so your items will be sent as soon as we restock the materials to fill your order. You will get a tracking email referencing the original order number (see question above). If you have a question that is not addressed above, please Contact Us.